Although it is not necessary to use a telescope to take astrophotographs, having one gives you more options. For example you could just use a 35mm film SLR camera mounted on a tripod and have fun just taking long exposure photographs of the night sky. Sure, the pictures will be of star trails as the sky moves above you, but so what! This is how I started in astrophotography. Acquiring a decent telescope with a motorized mount, an equatorial mount if possible, literally opens the sky for you. With such a telescope you could minimize star trailing by piggybacking your SLR camera to your telescope and allowing the motorized mount to track the stars as they move above you. If you are really ambitious, you can always try your hand at eyepiece projection or even prime focus astrophotography. Now I’m going to be truthful here, once you start delving into this realm of astrophotography things start to get more challenging. Due to this, the best thing to do at this point is purchase a web camera, or one of the many commercial digital cameras that are geared for this purpose. For example, Meade’s LPI or DSI digital cameras are examples of such devices. The picture to the left is of my Fujica 35mm film SLR camera with a Meade camera adaptor attached. 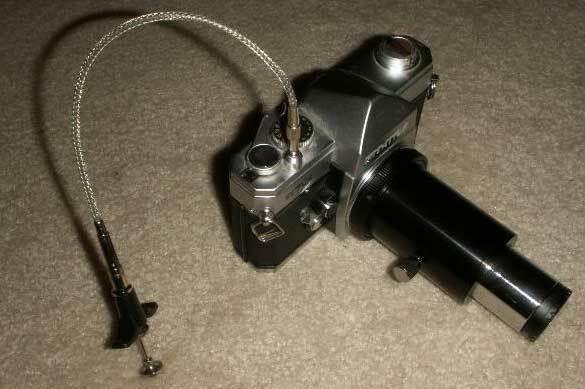 I have found this setup to be very sensitive to mount gyrations, so a very steady mount is absolutely required if you plan on using 35mm film for astrophotography. In my case I decided to go the inexpensive route and purchased a Logitech QC Pro 3000 webcam. Be sure that whatever webcam you buy it uses a CCD sensor chip as opposed to a CMOS sensor chip. This is because CCD based webcams are much more sensitive under darkened conditions. The best way to utilize these web cameras is to take the screw on lens that comes with them off and screw on a telescope to webcam adapter which can be purchased either from Mogg or other suppliers. Such an adapter is pictured below. 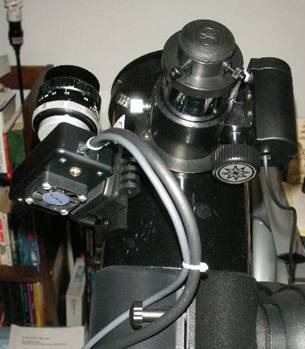 Once the adapter is in place you can simply slide the webcam into the focuser tube of the telescope and begin prime focus astrophotography. 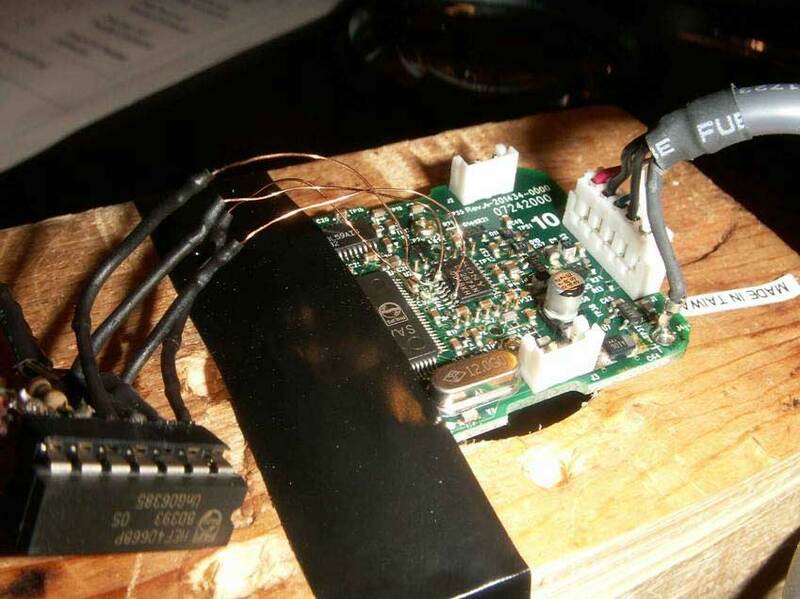 You will soon notice that no matter what you do to the webcam software to increase the webcams ability to detect dim objects you will hit a brick wall. Now I’m talking about deep sky objects, you will have no trouble photographing planetary objects like Saturn, Jupiter and the Moon. Anyway, I recommend you spend a good deal of time getting to know your setup by photographing planetary objects before you move up to DSO photography. It is important to add what software you can use to assist in taking planetary and DSO imagery. I use a few different software packages, but it is entirely up to you which one you prefer. I like to use K3CCDTools and AstroVideo as my primary image gathering software. Depending on the application I will use one or the other. In astrophotography it is common practice to do image processing after capturing the initial images. This involves aligning, stacking and summing up the many images taken during a session. K3CCDTools and AstroVideo have this capability built in, but it is possible to use software that is specifically designed for this purpose. I use Registax 4 to do alignment, stacking, and other work depending on what I’m trying to accomplish. I also use PhotoShop 7 for post processing of the stacked and aligned images. There is a lot of software out there catering to astrophotography, some free some not, so just search around until you find something that fits your needs. If you are ready for the DSO challenge you will need to somehow get long exposure capabilities. There are different ways of getting this, one example being to buy a camera with this capability such as the Meade DSI. This route tends to get very expensive very quickly, so I opted to go the more inexpensive route again which was to just modify my Logitech Pro 3000 for long exposure capabilities. Not all webcams can be modified for long exposures so it will be necessary to research before purchasing a webcam for this purpose. This is a picture of my Logitech 3000 circuit board after finishing up with the long exposure modification. The modification involves soldering four wires to the circuit board. The chip to the left where the four wires originate from is the heart of the modification. Here is where switching of the shutter and V-gate lines occurs, all of which is controlled from the computers parallel port. This modification was pioneered by Martin Burri and the details on how to accomplish the modification can be found here. The work done by Burri and others in this area of astrophotography has to be commended. I paid twenty-seven dollars for my Logitech Pro 3000 on eBay, and the chip for the modification cost me less than a dollar. I probably spent two and a half hours doing the actual modification, and by the next day I had everything housed in a kit box and ready for first light testing. 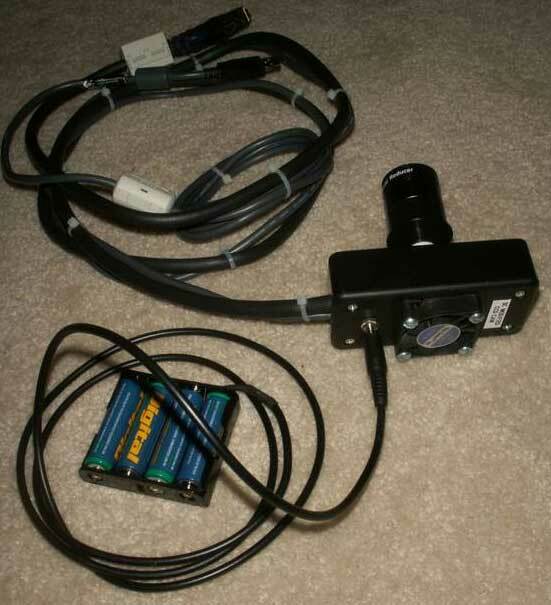 For less than thirty-five dollars I now have a working deep sky imager that works very well. In contrast if I was to just buy a DSI camera I would be looking at three-hundred dollars for a color camera, and upwards of four-hundred or more for a black and white camera. The 8bit Logitech Pro 3000 might not provide the best photographs when compared to an expensive 16bit DSI camera, but it gets the job done without leaving you broke. This is only possible due to the hard work of guys like Martin Burri and Steve Chambers, so my hats off to them! Once you have modified your webcam (if this is the route you chose to take) you will need to put the webcam in some sort of housing that will fit the mod chip along with the parallel cable that controls it. I purchased my kit box from Radio Shack. I also decided to add a small cpu fan to the design to try to suppress some of the hot pixels that make their presence felt during long exposures. I then used a four AA battery pack to power the cpu fan. This battery back only supplies six volts to the fan, but it is more than enough to keep air flowing through the circuits inside. As can be seen in the picture to the right, the webcam is configured for prime focus work. Prime focus means that the webcam gets inserted directly into the the focus tube without the use of an eyepiece. This will give you a rather high degree of magnification depending on the focal ratio of your telescope. In some situations this high magnification is a good thing, but in others you might want to get a wider field of view. Due to this I decided to get an Atik x.5 focal length reducer. These screw on lenses effectively reduce the focal length of your telescope making it faster. Here is a good explanation of how a focal length reducer works along with a good explanation of how a barlow lens works. In the photo above of the webcam adapter you can see that I have my focal length reducer attached to the adapter. I wanted to display how simple it is to add one of these to your setup. Using a focal length reducer allows more light to reach the CCD imaging chip, so this is good news for astrophotography! You will notice that many astrophotgraphers use focal length reducers, this is one reason why. I like to take wide field photographs of the sky. Well, wider shots than what is capable with a telescope anyway. One way which I have been able to accomplish this is by the use of a 55mm 1:1.8 lens. I use the same lens that came with my Fujica SLR camera which is pictured above. I had purchased a webcam to T-ring adapter for use in eyepiece projection work, and it just so happens that it screws right into my Fujinon lens. To the left is a picture of how I was able to piggyback my Logitech webcam and wide field lens to my telescope. I have just enough room between the adaptor and the lens for placing my IR cut filter or H-alpha filter in between the two. It’s amazing what a difference it makes in picture quality when the IR cut filter is used. Webcams are most sensitive in the IR range, so if this range is not filtered out you end up with reddish pinkish looking photographs. In the process of experimenting with wide field photography I came across what is called ‘field rotation’. This is the rotation of the field of view (FOV) over time. 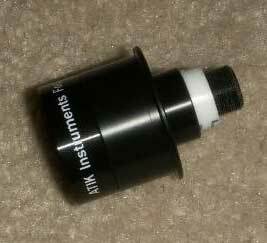 With an alt-az mounting system that does not control for field rotation, if tracking is otherwise perfect, the stars and other objects in the FOV will pivot around the center of the FOV during a CCD or film exposure or during a visual observing session. This is a big problem when it comes to astrophotography, and limits the effective length of your exposures. The best way to fix the field rotation problem is to use an equatorial mount and is the reason why I recommended the use of one earlier. Even equatorially mounted systems will suffer from field rotation if polar alignment is imperfect though, so care must be taken during the alignment process of equatorial mounting system. This will ensure that field rotation will be minimized or done away with entirely. There is another way to solve the field rotation problem which I feel needs mentioning as it negates the need for an equatorial mount. Software such as K3CCDTools3 and Meade’s Envisage v5.85 capturing software have the ability to cancel out field rotation. This is accomplished by setting two points on opposite sides of the captured images. The software then calculates the amount of rotation on each image and corrects all images before producing the final summed image. Of course, this approach has its limitations. Very long exposure times will display field rotation in each image making it impossible to fix with software. This is why a good equatorial mount is still recommended for astrophotography. Nevertheless, when taking shorter exposure times of around a few minutes software based field rotation correction can come in very handy. I have only scratched the surface of astrophotography here, and I’m still learning myself. My best advice is to experiment, and then experiment some more. Most importantly, be patient. This is a very challenging hobby, and this very fact is what makes it so great! So clear skies, and happy experimenting.